Childhood asthma is a complex disease which may be resistant to treatment and varies in its clinical presentation. The number of children admitted to emergency departments (EDs) with acute exacerbation of asthma is high and many are managed solely in the department. The correct assessment of the severity of an exacerbation can be achieved through competent history taking, examination and accurate recording of observations. Nurses working in EDs should be able to recognise the clinical signs and symptoms of acute asthma, assess severity and advise on appropriate management. 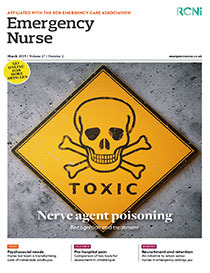 Nurses should have some knowledge of first-line management and how and when to help deliver these therapies. They should also be able to guide patients in discharge and follow-up care, develop a rapport with families and educate them on topics such as trigger avoidance. The assessment and management of these patients as outlined in this article is based on the British Thoracic Society/Scottish Intercollegiate Network guidelines (BTS/SIGN) (2016).